A sinus infection--or acute sinusitis--is an inflammation of the sinuses from a bacterial, fungal or viral infection; allergies can also play a role. According to a 2008 Health News website article, sinusitis affects about 31 million people in the United States. Honey has been used for centuries for its antibacterial properties, and now there is evidence that honey--specifically manuka honey, made from the manuka bush in New Zealand--may help treat sinus infections. According to Dr. Joseph G. Marsan, M.D., otolaryngologist and co-author of a 2008 study on manuka honey at the University of Ottawa, manuka honey has a powerful killing action on the bacterial biofilms present in sinus infections, an effect that is superior to that of antimicrobials currently used in medicine. Boil 1 cup of distilled water and stir in 1 tsp. of manuka honey. Add 1/4 tsp. of baking soda and 1/4 tsp. of non-iodized sea salt to the mixture. Pour the cooled mixture into a sterile jar with a tight-fitting lid. The mixture should be stored in the refrigerator. Use a sterile eye-dropper to apply the manuka honey antimicrobial nose drops. Draw out the mixture into the dropper, tilt your head back, and dispense 8 to 10 drops into each nostril. Repeat throughout the day as needed. Take 1 tsp. 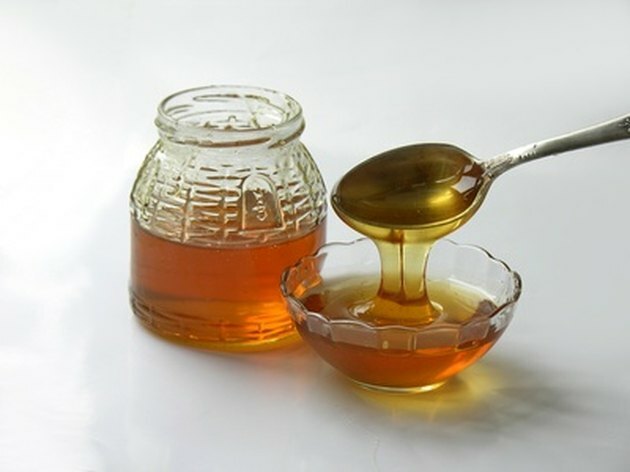 of manuka honey in the morning orally every day to help prevent the common cold, or rhinovirus, that often leads to infected sinuses. According to the Manuka Honey USA website, research conducted at Waikato University in New Zealand has shown that manuka honey destroys the staph germs that are typically present in common colds affecting the throat, nose and sinus. Take 1 tsp. of manuka honey in the morning orally, and repeat the dose five to six times during the day, to help alleviate the symptoms of an existing cold or sinus infection. Because sinus infections can have serious complications, you should see your medical doctor if your sinusitis suddenly worsens, becomes painful, or if you develop a fever. The use of manuka honey is a complementary therapy, not intended to replace medical treatment. According to the Healthy New Age website, manuka honey can interfere with the action of beta-blockers. You should not use it if you suffer from heart conditions, tuberculosis, or bee sting allergies. If you are diabetic, consult your doctor as to how much, if any, manuka honey you can safely take.